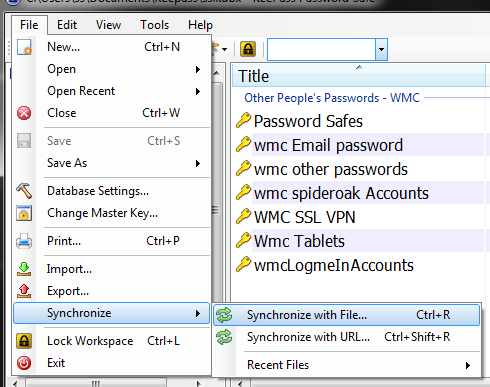 Now that I've converted myself, and most of my clients to the KeePass password safe, the question is, "How do we keep our passwords synched with our phones and tablets?" Normally, I make my passwords on my computer and just need to plug my phone and tablet into the computer occasionally and copy the updated file from my computer onto my phone or tablet. (I'll be glad to show you how to do this the first or second time). This will overwrite your older tablet or phone version. Sometimes new passwords were created, or were possibly created in both places. Now how do we do it? Copy your password file from your phone or computer to a transfer or download folder on your main computer. Not to your Keepass folder, but some temporary holding area you can remember. This will add any new entries from your tablet or phone to your computer and from your from your computer to your tablet or phone. Once done, check that the new phone or tablet passwords are on the computer, then copy the temporary file back to your phone or tablet overwriting you earlier version.